There comes a moment, in every band’s career (ok, not every band’s career) when they need to decide whether to “go big or go home”. 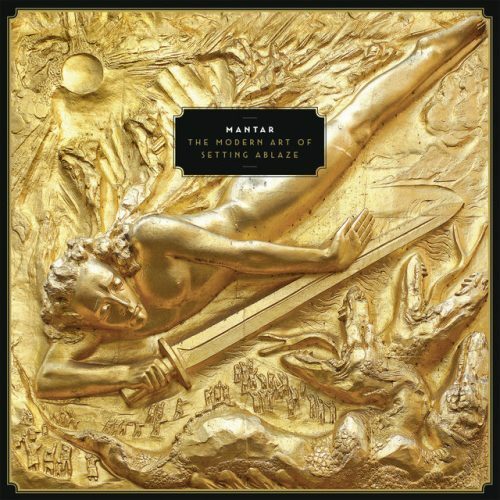 And it looks like that time has finally come for Mantar, as The Modern Art of Setting Ablaze is easily the biggest, boldest, and most shamelessly bombastic, album of their short but celebrated career, and is practically crying out to be performed on bigger stages and in front of even bigger crowds. Don’t for a moment think that Hanno and Erinc have sold-out though. Nothing could be further from the truth. In fact, for all the increased clarity and sonic heft which these songs display, their underlying essence is still as raw and as reckless as ever, and the dynamic duo’s distinctive brand of Blackened Doom Punk (or whatever you want to call it) remains heavier than most bands with twice as many members. Truth be told, however, it’s almost surprising that it’s taken this long for the band to “break out”, as the terrible twosome have always had ambitions above and beyond their station, and their sound – channelling everyone from Celtic Frost to The Clash, Metallica to Motorhead, Entombed to AC/DC– has always been bigger than it has any real right to be. Whether it’s the primal, priapic grooves of “Age of the Absurd”, the barnburning “Seek + Forget”, or the sadistic, strutting swagger of “Midgard Serpent” (to name but three of the album’s many highlights), the tracks on The Modern Art of Setting Ablaze blend darkly anthemic, arena-ready riffage and brutal, dive-bar belligerence in equal measure, so that – at times – it’s hard to work out whether the band want you to start banging your head, shaking your hips, or swinging your fists. Or possibly all three at the same time. 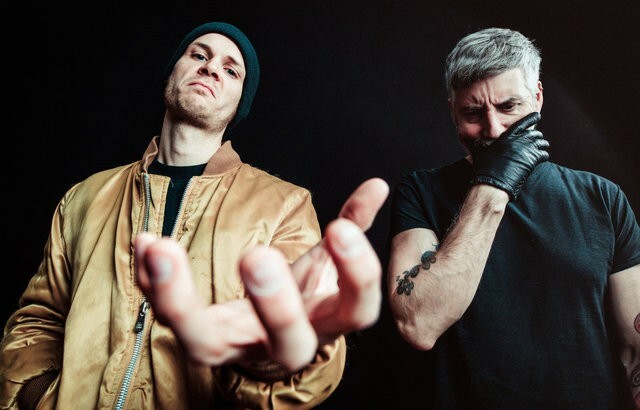 And while overall things might seem a smidgen less aggressive than on previous albums (though the pyromaniac Punk-Metal attack of “Eternal Return” might beg to differ), this is more than compensated for by a greater feeling of doomy, gothic gloom underpinning tracks like the monstrous “Obey the Obscene” and the slithering slow-burn of “The Funeral”, which makes me wonder if either Hanno or Erinc (or both) might not have been mainlining some Type-O Negative during the writing/recording sessions. Heck, even many of the wicked lyrical barbs (“some people say the world will end in fire.. so do I”) seem to possess an echo of the late Peter Steele’s ruthless, razor-sharp wit and grimly sardonic delivery! Still, none of these comparisons, from the most obvious to the most left-field, really capture the full-flavour of Mantar’s homebrewed heaviness; they’re all just ingredients to be thrown into the melting pot, and the real truth is always in the tasting. So I suppose the important question is, how does The Modern Art of Setting Ablaze compare to Ode to Burning (which, if you’ll recall, I singled out as one of the very best albums of 2016)? Personally, although it’s a close-run thing, I feel like The Modern Art… ultimately falls just short of its nigh-on invincible predecessor, as while it’s undeniably a beefier and more muscular affair, …Burning was simply that little bit more lithe and limber (and ever so slightly more lethal), and I’d argue that cutting a tiny bit of fat from this one (such as the superfluous intro track, along with perhaps one or two other, slightly less vital, numbers) would potentially have turned it into yet another career-defining effort. Still, if there’s any true justice in the world (and the jury’s still very much out on that particular question) this should be the album which finally propels Mantar into the big leagues. Which, let’s be honest, is exactly where they belong. Ode To The Flame? I always considered the Saint Pauli Sessions to be there best work, something about the mixing and slightly slower style that just makes the whole thing sound downright dirty. Well, that was just a live album, surely, and made up of material from their first album, wasn’t it? Therefore you are wrong and I sentence you to death… by burning!!! I CAN LIKE WHAT I WANT! That’s literally just Death by Burning recorded live. I’m not necessarily disagreeing with you technically. The debut may be my favorite record. These guys can do no wrong. Can’t wait to listen to the new one. Death by Burning is my favorite record by then but the Sessions are my favorite version of it.